Originally from Derry, New Hampshire, Adam is a graduating senior at University of Miami Frost School of Music majoring in Studio Music & Jazz. Adam has accumulated over a decade of experience in music studying jazz through multiple mediums, including saxophone, piano, clarinet, flute, composition, arranging, and film music. At the Frost School of Music, Adam studies saxophone under Gary Keller. He has performed with many ensembles at Frost, including the Downbeat Award-winning Concert Jazz Band, the Frost Septet, and the Henry Mancini Institute Orchestra, as well as numerous other ensembles. In addition to his studies with Professor Keller, Adam has studied composition with renowned composers Gary Lindsay, Martin Bejerano, and Stephen Guerra at the Frost School. In the summer of 2018, Adam spent a semester abroad studying jazz composition and German language at Johannes Gutenberg Universität in Mainz, Germany. Under the tutelage of Jesse Milliner and Claudius Valk, Adam deepened his knowledge of music greatly and brought back a new experimental mindset to Miami. Through ensembles at the University of Miami and other musical connections, Adam has shared the stage with the likes of Quincy Jones, Adam Rogers, Maria Schneider, Arturo Sandoval, and John Williams to name a few. In 2017, Adam was named the recipient of a Student Downbeat Award for his original composition “All Bets Are Off”, as well as the winner of the 2017 BMI William Golstein Scholarship for outstanding work in the field of jazz composition. 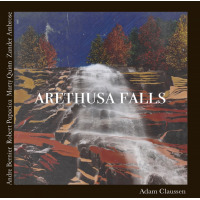 In February 2019, Adam released his debut album as a bandleader, Arethusa Falls. The album demonstrates Adam's skills in improvised music and jazz composition, as it features six of his original compositions written in 2017- 2018. All About Jazz musician pages are maintained by musicians, publicists and trusted members like you. Interested? Tell us why you would like to improve the Adam Claussen musician page.